RAGA, May 5: Governor of Arunachal Pradesh Dr BD Mishra has called upon paramedic staff to render their service to the people for a healthier Arunachal. The governor said this while interacting with paramedic staff at Raga on the second day of his two-day tour to Kamle district. He had visited the health centre and educational institutes here on Friday and assured to facilitate in providing a doctor and ambulance for the community health centre. DRCHO Dr Kapu Sopin DRCHO briefed the Governor about the health scenario in the district. While interacting with teachers at the Government Higher Secondary School Raga, the governor said, “Every action and activity in the school must be for the welfare of the student”. He enquired about availability of text books to the students and assured to facilitate in providing a National Cadet Corp unit and a bamboo-made auditorium for the school. 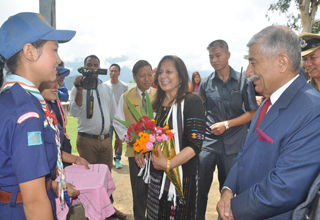 Local MLA Tamar Murtem, Deputy Commissioner Moki Loyi and Superintendent of Police John Pada were present during the visit. Earlier in the morning, the governor visited the proposed site for deputy commissioner office of the newly created district. He emphasised that required fund must be allocated at the earliest to enable the government officials to mitigate the challenges of the people in a more effective and efficient manner. The governor also had a meeting with Divisional Commissioner (West) Gamli Padu and deputy commissioners of Kamle and Lower Subansiri districts at Ziro and advised them to expedite the manpower distribution after the bifurcation of districts for smooth functioning of the district.